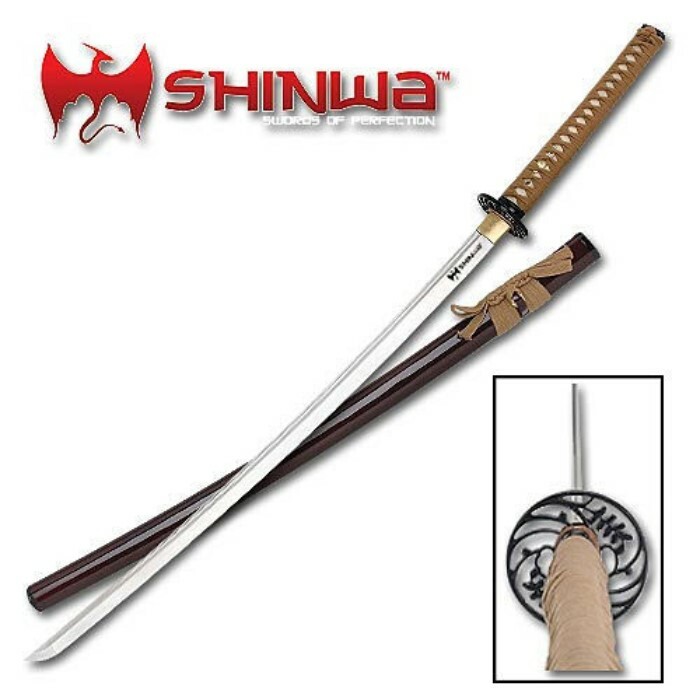 Shinwa Regal Brown Carbon Steel Katana Sword | BUDK.com - Knives & Swords At The Lowest Prices! Feel the power in this sword! Measuring 43 7/8" overall, this top quality Shinwa katana features a 29 1/4" blade made of 1060 high carbon steel. The blade is full tang construction, hand forged under extreme heat and folded to perfection, and is build to perform with razor sharp edges on both sides. The hardwood grip is wrapped in traditional style using brown cord, while the unique tsuba coordinates with the pommel in their use of a unique Oriental design. The sword includes a hardwood scabbard with brown nylon cord wrap and is presented in a custom velvet bag with care instructions. Super quality from Shinwa! Shinwa, KZ201CZ. I've had this tool for a few years now. The tsuba broke within the first week after falling off the stand, but I have replacements. When I took the katana apart to inspect it, I found that it is built traditionally, not bolt through, so I took it out for a test. I started with fruit then moved to straw mats and then green twigs. This thing cuts like a champ, but I did notice that there is something off after chopping through a 1 inch branch: there is a slight recoil. That was only on oak. We have a lot of mimosa here and I test all my swords on those as well - this one was able to chop down 4 inch trunks with no problem, but mimosa is a soft wood. When I got this katana, the first two inches of the blade (from the handle) was still a little flat which isn't an issue for me. After using this katana as a "fancy machete" to clear brush and weeds for the past few years, it still has it's razor sharp edge and is only slightly bent sideways (about 3 minutes of a degree) after plowing through a patch of weeds and hitting a hidden log wrong but it is barely noticeable without a laser. All in all, this sword is wonderful if you take care of it properly - oil after every use - it has nice balance, retains an edge, and can take a beating. Plus, of all my katanas (14, ranging from $100 to $1500) it has the best whistle when swung and is my second best, only under my spring steel tactical katana, and for the price, it is worth trying out. Another recommendation is to put an extra protective coat on the scabbard because the paint chips easily, and don't drop the sword because the tsuba is fairly fragile. Now, that being said, I do have a Damascus Shinwa katana that failed my tests; even though it was lighter and built the same, it was not very strong at all and chipped easily, but unless you're chopping brush with them regularly, I'd recommend those too as they're great practice swords.